What Will We Leave for Them? Home Lifestyle Rhea County Outdoors What Will We Leave for Them? It has been said the present generation is to take care of the earth for future generations. Having nine grandkids speaks to me in a loud and clear manner. What will I leave for them? What will we leave for our kids, grandkids and great grandkids? Something I find disturbing is summed up in one word- litter! It remains a mystery how someone can ignore the simple task of disposing of trash. People are content to toss things and let gravity take over. Several years ago, my son and I were dove hunting in a TWRA lease field. We found what seemed to be two boxes of empty shotgun shells. We picked them up, put them in a plastic bag we always carry and dropped them in the trash can. Another time I went trout fishing and was confronted by a five-gallon bucket of trash in the parking area. I picked it up and put it in the truck of my car. I fished for a while and later stopped at the local ranger station to find a dumpster or trash can. The rangers were surprised to see me lift the bucket out of the trunk. The Hiwassee Chapter of Trout Unlimited has a road clean-up each year. Their chosen area is thoroughly cleaned but after a week trash appears again and you can’t tell anything was done. When I fish at my favorite place near home, I always see fishing line, bait containers, and drink cans around the area. It’s not a major effort to walk no more than forty-three feet, lift a metal lid that weighs two pounds and drop the things in the container. Besides, walking and lifting is good exercise! Sometimes people can surprise you. Last year, I went to check my favorite fishing spot to see if it would be worthwhile to fish. I saw two ladies picking up trash. When questioned if they belonged to a club or organization, they said no, but they pick up trash to help keep the area clean. Find a place where there are people to watch you. Start to pick up trash at a place where people are fishing, swimming, cooking out, etc. Watch their expressions! Keep trash in a bag and properly dispose of it. Stores, gas stations, and parks are just a few examples that have trash cans or some way that you can dispose of trash. Oh yes, there should be trash containers at home. Recycling is another way to contribute to picking up litter. You can separate the plastics, metals, glass and paper. Be sure to wear gloves to do this. I am fortunate to have a recycling center within a mile of my home. 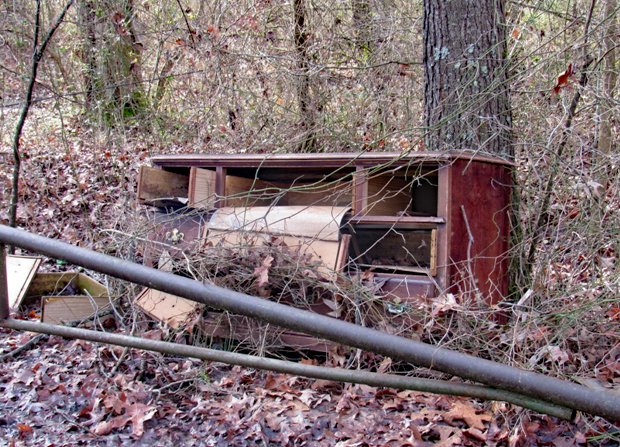 Make it a point to clean up the area where you hunt, fish, camp or hike. Carry plastic bags – no weight and take up no room in your pocket, tackle box or backpack. Be an example to your kids or grandkids. Show them how to be a responsible person. It’s up to all of us to leave the fields, woods and waters cleaner than we found them.